Indian cuisine and oil are like conjoint twins. It is difficult to imagine that any of our regional delicacies would taste the same, if the two were to be separated. The common perception is “How is it possible to cook without any oil?”, yet, many health conscious people had now begun to experiment with their food and shift towards a healthy eating habit. But, this meant only salads and fruits and a sacrifice of one’s favourite foods. Brand Philips that believes in the power of innovation for a healthy life, saw an opportunity here. 1) Low level of awareness. The Airfryer-related search trend on Google clearly highlighted this low-level of awareness (about Airfryer) among users. 2) No local information about its usage was available on the internet. On YouTube, there were hardly any Indian recipes related to the Airfryer. On Google, most of the content around Airfryer was either restricted to e-commerce players (selling Airfryers), or content mostly created by people living outside India (international recipes). This was a major hindrance, as people were not able to get ideas about the usage of Philips Airfryer, especially from the Indian cooking perspective and thus were prevented from considering the product. Create awareness about Philips Airfryer and tell people that it requires 80% less oil compared to normal cooking. Show people by virtue of local content how they can cook their favourite foods using the Philips AirFryer. Build engagement and talkability amongst the prospects. Instead of launching and creating its own YouTube cookery channel from the scratch, Philips leveraged and roped in India’s biggest YouTube influencer (in the cookery domain) named Sanjay Thumma. Thumma runs a cookery channel on YouTube titled VahChef with more than 330K subscribers. Apart from creating episodes, all videos of Philips Superchef show have been optimised with Meta tags and descriptions for YouTube search. All episodes are clubbed under a Playlist named ‘Healthy Recipes’. This is being done to tap users, who go to YouTube and search for healthy recipes, instead of going directly to a particular channel. Philips is also using the content created via Philips Superchef show on YouTube to reactivate female fans on its Philips Home Living Facebook page. The recipe episodes has been shared/weaved into the page’s content strategy in such a way that fans get to know about 3-5 new recipes every week (from May onwards). A lot of interactive activities like Q&A posts, contests and chat sessions related to Thumma’s Airfryer recipes have been incorporated into Philips Facebook content strategy. Strategically, it was decided that first Philips will post the Philips Superchef recipe episodes and after that Thumma will post it on his Facebook page. It’s being done to classify recipe episodes as original content and indicate Facebook that Philips is the creator of such content. 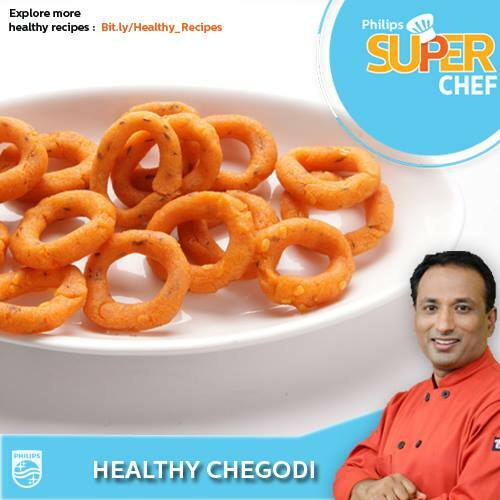 A Facebook App titled ‘Fried Yet Light’ has also been created along with the site “FriedYetLight.com” to aggregate and showcase the Philips Superchef show recipes at one place and talk more about the product and how it works. A targeted paid-digital media campaign was kick-started (in the last-week of August in partnership with Isobar) to boost the awareness of Airfryer. Mobile ads and online banner ads on LinkedIn, women-centric sites like Idiva.com, Vogue, BBC etc. is in progress. Considering that a lot of people will search for Airfer post seeing the ad, a search advertising campaign has also been initiated. Apart from regular keywords like Airfryer, health-related keywords like ‘Healthy Food for Kids’, ‘Healthy Breakfast’ etc. are also included in the search advertising plan, to capture users looking out for healthy recipes. All paid media ads redirect users to a landing page titled FriedYetLight.com which provides more information about Airfryer and also includes Superchef episode recipe videos, as stated earlier. The overall impact of the strategy can be gauged from the indication of interest (on the internet) of users in Airfryer through Google. 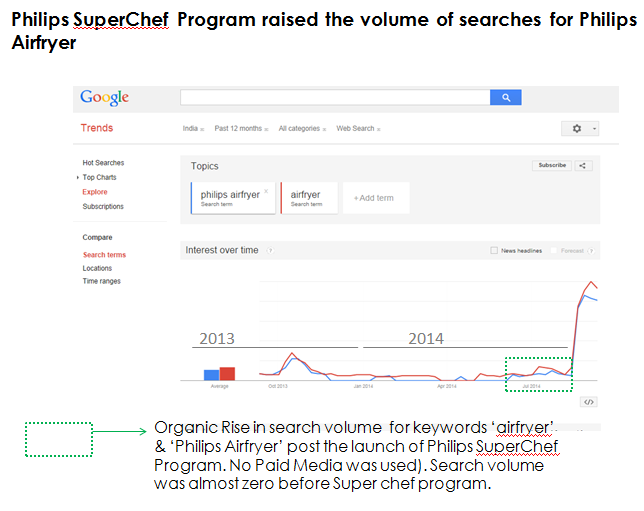 a) The search volume for Airfryer (on Google) jumped up noticeably post the launch of Superchef Show in May end. The search volume for keyword ‘Airfryer’ has gone up further post the launch of paid campaign. The strategy has started showing its impact on YouTube as well. Apart from generating video views of 3.71 lakh (organic views), large number of recipes now appear in Airfryer related recipes search results on YouTube. a) Search for keyword “Air Fryer recipe” on YouTube yields 9 out of 20 results on its first page for Philips Airfryer SuperChef program. b) Search for keyword “Philips Airfryer” on YouTube yields 3 out of 20 results on its first page for Philips Airfryer SuperChef program. c) Search for keyword “Air Fryer/Airfryer” on YouTube yields 5 out of 20 results on its first page for Philips Airfryer SuperChef program. On Facebook, Philips managed to generate engagement (from female fans) and reach for non-contest related content as well. a) The organic reach of Facebook posts (related to Philips Surperchef Show) went up from 1000 users to as high as 78,000 users due to engagement generated by fans with the post. The reach of content (for females) went up from 20% before the Superchef show to 77% (as of now). The VahChef YouTube channel is my favourite destination for delicious Indian recipes, as I personally like the chef’s presentation skills. So I must admit, I first came to know about this innovative product while browsing through his playlists to discover some interesting new recipes. For a relatively little known product like the Philips Air Fryer, the brand has definitely raised awareness and with the accompanying demo videos on how to use it, the strategy seems to have worked (as can be seen in the results above). Collaborating with a popular and widely subscribed YouTube chef further adds to the product’s usage and helps it target a wide and relevant target group – the digitally equipped, health conscious, urban consumer always on the hunt for products that enhance his life using technology. The campaign uses a clever combination of branded content and fan engagement to not just build awareness but also brand affinity through creative use of digital and social media.